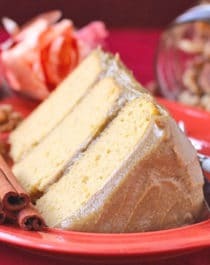 Do you believe me when I say that this Pumpkin Cake with Butterscotch Frosting is actually healthy? Well, you should, because it is! 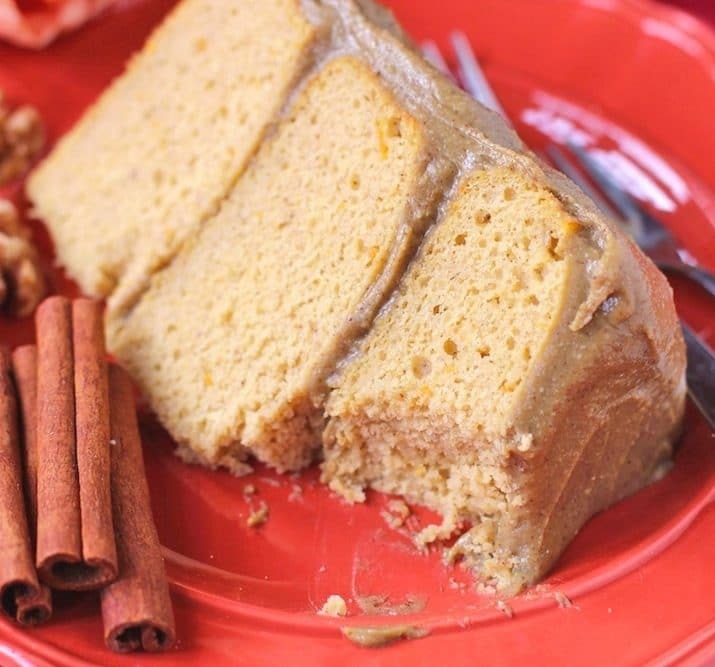 This healthy gluten-free Pumpkin Cake with Butterscotch Frosting is whole grain, refined sugar free, and contains ZERO butter (I think Paula Deen just shuttered there for a moment). This cake may be good for you, but trust me, you’d never know it. See that wonderful texture? The fork just sinks right through. This cake is soft and moist, you’d never guess that it’s made without a copious amount of butter and oil. The entire recipe only calls for one tablespoon of oil! 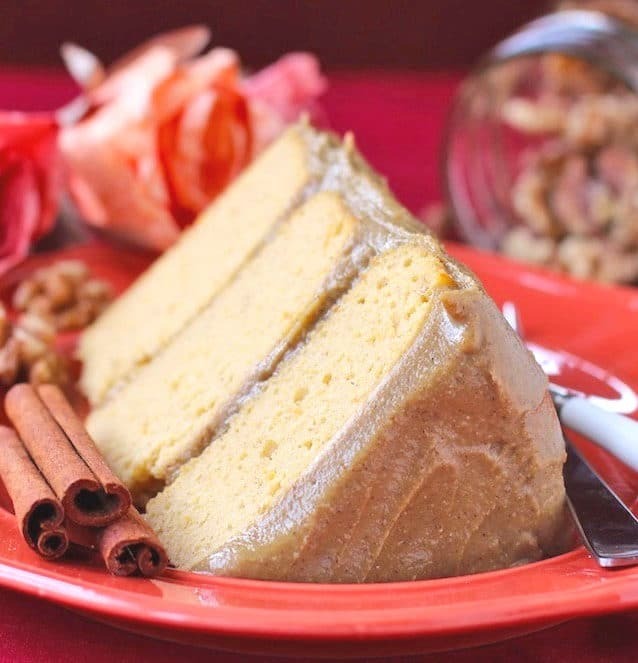 The cake and frosting together are sweet and packed with flavor, you’d never know that the slice in front of you is refined sugar free and all natural. Preheat the oven to 350 degrees Fahrenheit and spray three 6" cake pans with cooking spray. In a small bowl, whisk together the sorghum flour, brown rice flour, starch, baking powder, cinnamon and salt. In a stand mixer bowl with whisk attachment, add the pumpkin, soy milk, egg whites, vanilla sugar, oil and extracts. Whisk on medium/low speed. Add the vinegar to the mixing stand mixer, then slowly add in the dry ingredients. When all is incorporated, scrape down the sides of the bowl. Whip batter on medium/high speed for 20-30 seconds. Pour batter into the three prepared pans and bake for 28-33 minutes, or until the surface of the cakes spring back when tapped. In a large mixing bowl, whisk together both protein powders and the coconut flour. Whisk in the soy milk, then whisk in the extracts, spices and natural food coloring. Frosting should be thick (add coconut flour or protein powder if you want it thicker, added teaspoon by teaspoon). 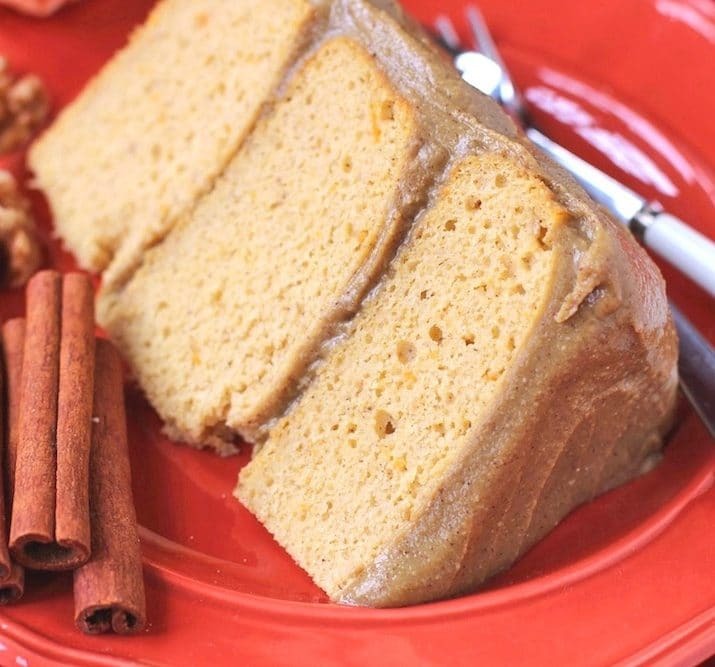 Frost the cake, refrigerate for 30+ minutes to set, then slice, serve, and enjoy! ***I also added 35 drops of Natural Orange Food Coloring because I wanted the frosting to look more caramel-like, but that's totally optional! I like to take some spare time during the busy holiday season to unwind by watching a favorite holiday movie with my parents while snacking on healthy brown bag popped popcorn. my holiday tip: bake ahead of time!! especially for thanksgiving pies or Christmas cookie exchanges. this way you can prepare or come up with a plan b if something goes wrong!! Always to make the dessert ahead of time along with all vegetable prep! favorite tip shortcut: prepare all you can the day before the holiday to save time and enjoy your guests. I love to buying a healthy twist to every dish and add as many veggies as possible. My tip: Plan the timing of every dish in/out of the oven, stove, refrigerator, etc. and create a schedule so the day you are going to cook it will be stress free ! I also like to set out ingredients for each recipe on a table and make sure to prep everything in advance. If you’re hosting a holiday dinner provide the main dish, and a side dish or salad, but ask your guests to bring something. It’ll save you so much stress and time. And always ask if you can bring something to a party you’re attending. Even if the host doesn’t require you to bring something, many times they at least appreciate the offer. My holiday tip/shortcut is to make a batch of cookies (varying recipes) once a week a few weeks leading up to Christmas. Bake one or two cookies from each batch to enjoy, but freeze the rest and bake as needed for holiday gatherings! I started doing this a couple of years ago, and it is so much less stressful than making a ton of cookies a day or two in advance. Good luck to everyone in the contest! I love lists! I like to organize my calendar and plan out my to-do’s and shopping lists to try and minimize the holiday craziness. Another thing that I have realized over the last couple of years… it’s okay to say no every once in a while and spend a quiet night at home! The easiest and most delicious go-to for holiday gifts and parties is saltine cracker toffee. Everyone thinks you slaved over making it- but it just takes some basic baking ingredients and a few minutes in the oven! I make my pies the day before and cut up vegetables for the stuffing the day before so I just have to focus on the turkey! My tip is start shopping early-sometimes if I find good sales in the summer I will start stocking up for Christmas gifts! I like to use the crockpot whenever possible, it leaves my oven free for other things! I shop online to avoid the traffic and stress. My holiday tip is to not stress! It’s easy to be overwhelmed with things to get done around the holidays, but being a giant stress ball ruins everything! Get things done little by little and feel free to take breaks! My holiday life saver tip is doing all prep work the night before. Having chopped veggies ready to go saves me an enormous amount of time day of. Using baking mats while baking cookies ensures perfect cookie every time! I use Pam for everything! My mom has a great holiday baking trick that I have adopted: she butters the pan and uses white sugar instead of flour. The sugar caramelizes the baked good and makes a slightly crispy and super sweet outside! My time saving holiday tip is I bake pies the day before the big meal and do as much prep work the day before. As far as shopping I do it as early in the year as I can so I can skip all that horrible holiday store crowd stuff. We keep it simple by only getting gifts for the kids and letting them pitch in with the dinner preparations. My shortcut is use the microwave! Instead of a double boiler to melt chocolate, I zap it in the microwave – so much easier and still creamy! scheduling in workouts keeps me sane! My favorite tip is to make whatever I can ahead of time. I love to do a makeahead casserole for xmas day. I cannot tell you how amazing this cake looks! Thanks for the giveaway! My tip is to start cooking at least two days before Thanksgiving with dishes that can be refrigerated and reheated! It saves so much time and scrambling on the big day! Thanks! I make lots of pie crusts ahead of time and freeze them! best holiday tips? make sure you have a back up plan in case something goes wrong, like you mention with the cake! Holiday tip: cookies, bars, breads, or homemade bark can be a great gift, as long as the wrapping and delivery system is special! Cellophane or printed bags can add a special touch, as well as boxes or handmade labels. I always try to do whatever I can ahead of time. Prep everything you’re going to cook the day before so the day of, all you have to do is assemble and stick things in the oven! i try to prep everything ahead of time. also, my family delegates responsibilites so that everything doesnt fall on just 1 person. I’m not sure if this is a tip or just common sense, but I feel like I fail at it every year: when baking a dessert from a new recipe for a holiday party, do not wait til the day of the party to do it! My tip is to make large batches of food gifts at once to give away to friends and family. You can always freeze items or can them yourselves. It makes the holidays so less stressful when you plan ahead and so much more rewarding to give homemade gifts! I like to prepare and precut as much as possible and make some things in the crock pot so the whole process of big meals is easier and less stressful!